I thought this book is some kind of a horror or suspense book because of the cover. I got intrigued but afraid to read it too because to be honest I don't like reading horror themed books. When I started reading I found myself that I kept flipping the page of the book until I get to the next chapter. I was really interested and confused. I want to find out more about Molly. Who she really is and what was happening to her? I am already expecting a big twist or revelation. I am getting excited as the story goes. Just to tell you the truth I enjoyed reading the book even at work I bring it with me and one of my boss asked me what was I reading so I told her about it. For me the story is a mind twisting one, I really got confused but I know something is wrong I just can't figured out what was it. My mind was challenged. The twist of the story is a smooth one but it gave me goosebumps besides the book made me guess with what will happen next and I like books like that. This book is a great read honestly. The way it was written is a a great one, imagine how you'll switch two people's view it was awesome another thing is that I was like watching a movie while reading the book. It was a great experience reading something like this. The book was short yet full of interesting scenes hopefully there is part two because I feel like I want more of it. The characters are great ones. It's just that it is sad because someone has to die but the death of that person changed everything in Molly's life. Every little missing pieces became a whole one. It was cool. Molly on the other hand, the first time I met her I thought she is a crazy person, like really crazy that she has to be in a mental hospital something like that or worse but I finally understand what was happening when I read the whole book. * Just saying readers should read everything too! So I guess that's it for my review... readers must try this book. It won't take long to read because it is a thin one yet a great book. You'll like it. "You can't decide how much you love people. It just happens. If you have to think about it, then it's not really real." Hi! I'm Katrina. 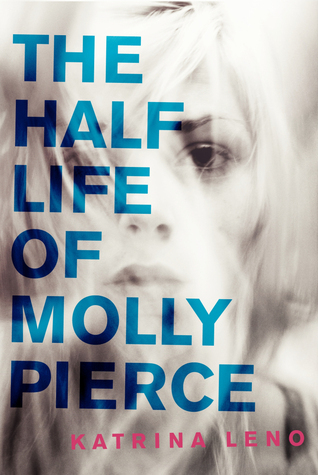 I write books for young adults, like THE HALF LIFE OF MOLLY PIERCE, which came out July 8, 2014 with HarperCollins. If you like writing and photography, might I suggest you take a peek at my blog. For inquiries and love notes, you can reach me here. Site design, custom header, and watercolor care of 200Lemons.